This is one view of her elbow after surgery. 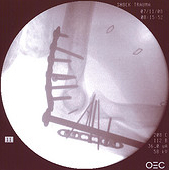 The image includes a hand drawing from the surgeon of her pre-surgery break. This is another view of her elbow after surgery. The two images are slightly different. In one there was an extra plate in there that was removed for a reason I don't remember.